Subscribe to Liberty Culture and receive notifications of new posts by email. A Blog on Faith & Scripture Intersecting Life & Society. Many church-going Christians seem disengaged today… disengaged in the sense that we are not living out an engaged relationship with Christ within the church. Most Christians never move from the pew to service; but God calls each Christian to move into some form of service to Christ within, and outside, the church. God gives us an internal “spiritual” calling to love and serve the Lord. Many Christians become wrapped up in fear and a sense of inadequacy, and put up a wall between God and his calling. We feel more comfortable keeping God and His calling a safe distance from ourselves. Why? Because we’ve been deceived into thinking that it ought to begin with ourselves. Today’s popular theology unwittingly teaches that this calling is about us… but it’s really NOT about us. We are only participants but we act like we are the “star players in the game” of service and ministry. One reason for our fears of inadequacy is that we think we have to measure up to God’s standards of holiness. God’s calling is a holy calling. We haven’t seriously considered God’s holy calling for what it really is because we think we have to first measure up to God’s standard of holiness. The truth is: we don’t measure up, and no one ever will. But God has already taken that into consideration and given us enough grace to walk into this calling and see it to completion. 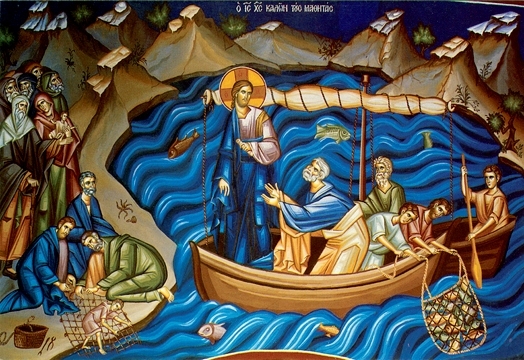 Jesus called some rough and simple fishermen like Peter, James, John and Andrew into the ministry, didn’t he? God’s salvation was given to us and made possible when he cleansed us of our sins. So the holiness that God expects is not due to our own conduct or actions. It is not due to our good works or good deeds. God’s work of sanctification is not the same thing as our life of walking in God’s holy and righteous laws. Our human acts of love, mercy, kindness, etc. are already expected of all followers of Jesus. It’s a given. It was expected when we first came into a love relationship with God in Christ. We should be compelled to obey because He has been so gracious and loves us so much. We can never repay God for his gift of forgiveness. So how can we, as sinful human beings, possibly match up to God’s standards of holiness? We can’t. First and foremost, it is really about God’s work of cleansing of our sins. Only God can make us holy. That’s what Paul is talking about when he talks about the gift of forgiveness by grace through faith. It starts from God. It is ONLY God who makes it possible. It’s all about God—and it is NOT about us. Paul said in Ephesians 2:9, “For it is by grace you have been saved, through faith —and this is not from yourselves, it is the gift of God— not by works, so that no one can boast.” If God’s call to salvation began with God, then he will also complete the calling to serve Him. Paul said: “being confident of this, that he who began a good work in you will carry it on to completion until the day of Christ Jesus” (Philippians 1:6). If God calls each of us to be engaged with the Lord’s kingdom work and service, then we can ask the Lord to help cast our fears aside to have faith that God will empower us for service in His love. God wants us to simply obey and follow him, and when we fail or fall, we get up and start again. God enables us to serve in His God-given holiness; then, God enables and empowers us through his Spirit and gifts. Next Next post: The glory of God in creation… or modified creation?